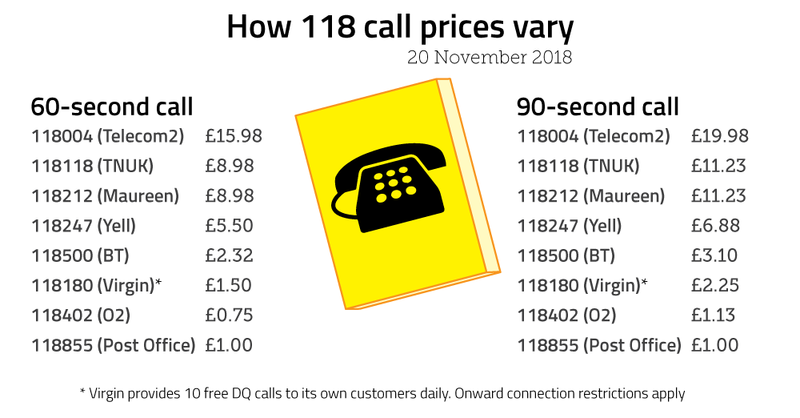 People who call directory enquiry services will be protected from high prices under a new price cap on 118 phone numbers, announced by Ofcom today. We have been concerned about directory enquiry prices rising steeply. Some providers charge almost £20 for an average 90-second call. The price charged by the most popular service – 118 118 – for a 90-second call is now £11.23. Although there are cheaper services available, Ofcom’s research shows that consumers tend to call the numbers they most easily remember. And while the number of calls being made to 118 services has been falling by around 40% every year, more than a million people in the UK – many of them elderly – still use these services. The cost of calling many of these services is now well above what people expect to pay. Ofcom’s research estimates that around 450,000 consumers a year are paying £2.4m in total more than they expect for these calls, with some struggling to pay their bills. So Ofcom is stepping in, by capping the maximum amount a 118 service can charge at £3.65 per 90 seconds. This will bring prices back to 2012 levels, and closer to what people expect to pay. Ofcom’s research found that four in five 118 callers (82%) say it is important to get hold of a number they need at the time they call a directory enquiry service. People aged 65 and over are four times more likely to call 118 numbers than those aged 16-34, and are significantly less likely to have internet access when they need to find a number. We also found that nearly two thirds (65%) of 118 callers don’t know how much calls cost. Two in five (42%) say they have no alternative than to use a directory enquiry service at that time, and a similar proportion are charged more than they expect. So the new price cap will protect consumers from unexpectedly high bills, and make directory enquiry services more affordable. To allow providers time to adjust their prices and billing systems, the price cap will come into force on 1 April 2019. The Number UK (TNUK) accounts for the largest volume of directory enquiry calls in the UK (around 40%), followed by BT (between 20% and 30%). There are nine directory enquiry providers that have a 118 number with published service charges of £15.98 for the first minute of the call and £7.99 for each subsequent minute. 2. The number of calls made to 118 numbers has reduced from 7.14 million in Q3 2014 to 1.95 million in Q2 2017 – an average annual decline of 38%. Price increases over the same period mean that the revenues of directory enquiry providers have declined from £27m in 2014 to £12m in 2017 – an average fall of 26% per year. 3. Of those consumers who use directory enquiry services, 8% experience affordability issues as a result, either cutting back expenditure on other items, borrowing money from friends or family to pay their bill, delaying payment or defaulting on their bill altogether. 4. 26% of directory enquiry users overall say they have an internet connection when they call a directory enquiry number, compared to 13% of users aged over 65. 5. 118 numbers were introduced by Oftel, the previous telecoms regulator, in 2003. The directory enquiry market was opened up to competition and a wide range of competing 118 services were launched.